Windmere humidifier filters clean the water entering your humidifier of unwanted contaminants, keeping your home's humidified air clean. The WIN2 is the correct replacement humidifier filter for Windmere WHU-125 and Windmere WHU-125 humidifiers. Special Order. Ships in 175 days. The Windmere RW-2/214 Humidifier Wick Filter offers high performance as well as high output. 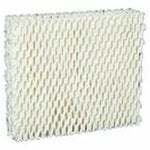 The Windmere RW-2/214 Humidifier Wick Filter features honeycomb filtration to trap mineral pollutants.